Artificial Intelligence (AI) is the new catch phrase at most government departments in the UAE and Dubai’s Roads and Transport Authority (RTA) seems to be driving the movement. From customer service and feedback management to drivers’ training and mass transit, AI is at the heart of Dubai’s expanding mobility sector. Long before the phrase entered the common parlance, Dubai Metro hit the tracks as the world’s longest driverless train network, driven by artificial intelligence. Maiden flight of the world’s first flying taxi in Dubai, the Autonomous Air Taxi (AAT). It’s a vehicle that will be used for the world’s first self-flying taxi service set to be introduced by Dubai’s Roads and Transport Authority. The two-seater AAT, capable of transporting people without human intervention or a pilot, has been built by Volocopter, a Germany-based specialist manufacturer of autonomous aerial vehicles. The test flight was held in September 2017. The RTA now aims to make AI its primary focus, looking to have one in four public transport journeys driverless by 2030, besides employing AI in pedestrian crossings, driver training, monitoring of drivers as well as communication. “The future is autonomous and driverless transport and it heavily uses artificial intelligence technologies such as machine learning, deep learning, computer visions and robotics. 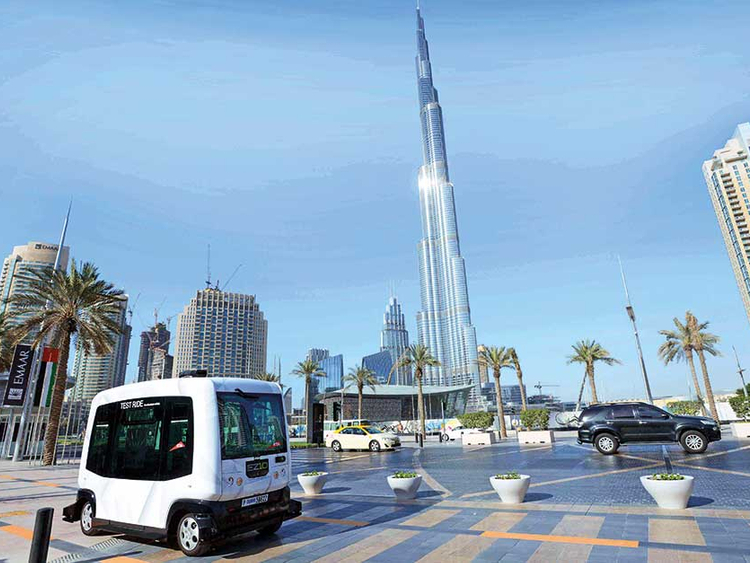 With the aim of making one in four journeys on mass transit driverless in Dubai by 2020, RTA has developed a strategy to realise autonomous public transport that is more efficient, cleaner and safer,” said Mohammad Al Khayyat, Director, RTA Smart Services. He added that the RTA is planning to introduce AI-drivern autonomous vehicles in different sectors of Dubai’s public transport including buses and taxis, along with the expansion of the Dubai Metro, which is already autonomous. Smart kiosks and customer happiness meters are being AI driven. “We are tyring to engage more customers by developing self-service offerings. The customers’ happiness meter is based on AI and it gauges customer’s happiness through facial expression recognition,” said Al Khayat. ‘Al Raqeeb’, an AI-driven safety and efficiency system for public buses keeps an eye on bus drivers and alerts the command centre if it detects anything unusual. The system has a sophisticated device fitted in front of the bus driver to monitor any indicators of fatigue, tiredness or illness suffered by the driver, which are transmitted to the Control Room at the RTA where the case will be immediately responded to. A trial phase of the system has shown that monitoring devices have helped reduce fatigue-related cases by 88 per cent. Smart Pedestrian Signals: These are run by a system based on sensors connected to a ground optical system synchronised with the signal’s light operation. It uses AI to perceive the pedestrian movement and automatically readjusts the remaining time based on the inputs “for safe crossing for the largest possible number of pedestrians in a smooth manner with minimal impact on the movement of vehicles,” said Al Khayyat. Enterprise Command and Control Center (EC3) facility: Driven by AI, it provides secure, scalable, and flexible operations and serves as a city-wide crisis and traffic management centre. “The Big Data platform in EC3 has machine learning capabilities to enable traffic model calibration and multi-agent simulation for vehicle and people. In event planning, EC3 utilises AI for the management of accidents and crises, simulating various scenarios and reducing response time and human error,” said Al Khayat. The flying taxis also form part of the driverless transport movement, which is based primarily on the AI technology. Last year, the RTA signed two separate agreements to introduce flying taxis with Volocopter and Uber. Trials on the German firm Volocopter’s Autonomous Air Vehicles (AAV) began late last year and will continue over the next five years allowing RTA and Dubai Civil Aviation Authority (DCAA) enough time to jointly come up with rules and regulations for the new transport system. Last year, the RTA also signed another agreement with Uber to study the introduction of Vertical Take-Off and Landing Vehicles (VToL) or aerial taxis by 2020. The study is currently under way and the first VToL demonstration network is expected to be ready in time for Expo 2020 in Dubai. It is the UAE’s biggest mass transit system and the world’s largest driverless train network. What does the AI technology do here? Works out the intervals (headway) between journeys, measures the distance between rolling stocks, and automatically realigns the headway between services in case of breakdowns or delay in scheduled journeys. “The primary function of this system is to prevent hazards such as collisions between trains while allowing trains to travel at the maximum speed consistent with safety,” added Al Khayyat. Testing of drivers on a Smart Yard is AI driven. It reduces human errors in examining the drivers during the yard test. “The AI-driven technology not only monitors the trainee’s manoeuvring skills but also helps him avoid collision through alerts,” said Al Khayyat. Yard tests are conducted to test the basic skills of trainee drivers before they are taken out on road for the final stage of training. The test has five components: parallel parking, roadside parking (60 degrees inclination), garage parking, slope (hill), and sudden braking. The project has the test yard fitted with five surveillance cameras, four of them outside the vehicle to guide the trainee to the locations of the five manoeuvres. The fifth camera is fitted on board the test vehicle to verify the identity of the driver during the test. The test vehicle is equipped with more than 20 sensors to help the trainee avoid collision. The yard is fitted with sensors that automatically transmit images of the test, once the vehicle passes through them to a processor that spots mistakes made by the driver. Misusing bus and taxi lanes? Watch it, AI-based technology is watching you. “Dubai has several kilometres of bus and taxi priority lanes spread across the city. Automatic number plate recognition cameras have been installed and activated and fines are automatically issued against owners of the vehicles misusing dedicated bus lanes,” said Al Khayyat. This has improved the speed of RTA buses by 20 per cent, while the dedicated bus lanes also help reduce traffic congestion and operation costs.